There’s nothing better than exposing your products/services on a new, well designed website which was tailor made accordingly to your needs. The excitement during the first few days is really high, that’s why it’s easy to forget about some important steps to take in order to have everything under control and manage your online business without surprises. Google Analytics is an invaluable source of data. It shows all the details about your website traffic. Ex. how many visitors have visited your website in a specific date range, how long they stayed in the website, which device they used, which pages they visited etc. etc. An important piece of information comes from the bounce rate which represents the amount of people who navigate away from the website after having viewed one page. It’s very important to know which part of the website your visitors leave, so that you are able to improve the layout/content for that page. A low bounce rate is a reflection of a high performing website. Another important function in Google Analytics is goal setting. Goals represent your “highest value conversions”. A goal can be the registration of a transaction with a minimum purchase amount or the visualization of a “thank you” page after the completion of a request info form. With Analytics goals you can precisely track the results obtained with the traffic of your website. You have probably already heard this several times but it’s a must in order to have a good SEO ranking. Original, snappy and user engaging content is what you need to escalate your ranks in the organic search. The more useful your content is for your users the more it will be shared and you will have the opportunity to be referred by other websites. This is also known as the backlinks strategy. The more backlinks your website has the louder your voice in the web and the higher your ranking position. This content-analysis tool helps you to align with SEO best practices for content production. Always remember to write short and memorable paragraphs, research the top keywords for your industry, keep an organized text structure and add media elements when needed. Advertise or else get forgotten! As a former colleague of mine once said, “having a nice website without anybody knowing about it is like having a Ferrari parked in a garage”. This comparison is so true! How do you attract new potential customers when you have your new shiny “toy” to show? SEO optimization is a crucial activity to improve your exposure and has to be done regularly, however its results are not immediate and you can’t wait too long for new business. – What is the best platform for my product and why? – Where do the majority of my customers spend their time when they are online and what do they usually do when they browse different websites? – What are the best technologies in the market to make my advertising campaigns successful? These are just few of the questions we help our customers to answer on a daily basis. 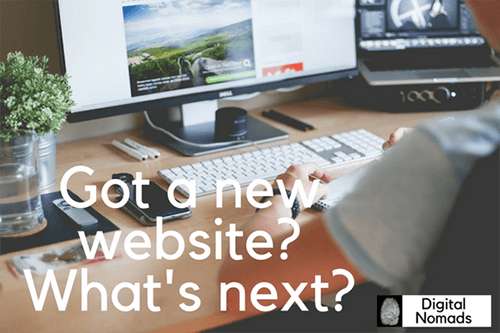 Do you wanna know how to jumpstart your business and take full advantage of your new website? Give us a buzz!